Poor balance (on occasions falling over or tripping mid-step. They will with have problems in getting parts of instruction in the correct order and therefore may have a problem in getting the next movement correct (co-ordination). Problems with spatial awareness, or proprioception (determining the distance between themselves and other objects). This disorder can cause an individual to be clumsy to the point of knocking things over and bumping into people accidentally (be prepared for the odd knock or bruise). Many with dyspraxia have problems with orientation especially left and rights (take this into account when giving verbal instruction. Many dyspraxics fail to find their dominant side and can shift from one to the other; don’t be surprised if they start off with a different foot each time. Riding a bike calls for multi-tasking which is difficult for most and requires great short and long term memory as well as co-ordination/planning, instruction therefore has to be slow and in short sequences. We also need to be aware that most with dyspraxia won’t have great special awareness so make sure they have lots of room to manoeuvre; but don’t let that stop you or deny them the opportunity of giving it a go…most master the technique. Reduce the scrapes? bumps and bruises can be minimised if the child wears long trousers and shirts with long sleeves. Always time you practice when you have time to dedicate (avoid distractions at all cost), make sure your child is alert and has plenty of energy. Choose a good flat surface with few or preferably no obstacles. 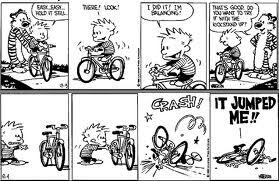 Try and use a bike with good natural balance and a low centre of gravity. Lower the saddle as this will allow your child's feet to be flat on the ground. There is instant safety and security this way… don’t assume that all looks rosy… anxiety/nerves will be present in most children. Make sure there are no bells…mirrors…tassels…gears, etc. as these all cause the child to become detached from the task at hand. Make sure there are no distractions around limit observers to yourself… most children want to look at Mum/Dad to gauge reaction…this is when they are likely to lose concentration and tumble. Taking the pedals off at first can be an excellent idea. Start with a slow introduction… short little spurts of a metre or two, just letting the child push the bike with their feet, while their balance and confidence improves. Slowly increase the distance and constantly stop and ask them how they feel and give praise. If you choose to help your child learn to ride initially with you holding the saddle, make sure you stand back from them and hold it firm to start with and gradually release your grip till you let go but be ready to grab hold if needs be and make sure you help them come to a stop. Stabilisers can be raised gradually. One can be removed if they tend to lean more to one side and again hold the back of the saddle if need arises. Keep going with the instruction as they will eventually master the technique…starting on a trampoline is a great way to improve balance. Please note all our posts are for guidance only and using or seeking advice from a professional is often the best way forward.